Quick, easy, cheap and delicious! Give this recipe a try, there is a lot of flavor here and its easy to make. Plus it can be eaten hot, warm, or cold. It reheats very well, and tastes better with time (just like chili). If you are staying somewhere for a while, make a big batch and you’ll have enough food for a couple of meals. 4) Add rice and beans to the pot and continue to cook on medium until warm, about 5 minutes. Stir occasionally. 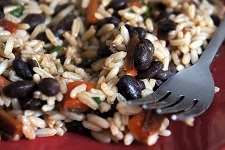 5) While rice and beans are warming, wash and cut cilantro. I use about a handful of chopped cilantro leaves. 6) Add cilantro, stir well, allow flavors to blend for a couple minutes. -Take some in a Tupperware bowl with you while you walk around the city, its great cold as well. This is delicious! We had the honor of Ben and Leah (the creative geniuses behind this recipe) make this in our kitchen. It was wonderful.